Overblow BoosterN E W ! Slip-Slider N E W ! Lucky 13 N E W ! DM48 Midi Harp Accessories N E W ! UNADORNED (2018) N E W ! SPECIAL OFFERSN E W ! As you can probably tell from the name 'Brendan Power', I have an Irish background. Though born in Kenya and raised in New Zealand, I heard Irish music as a kid on my Dad's records, and always loved the sound. Inspired to pick up the harmonica after hearing the sublime Sonny Terry play the blues, it wasn't long before I was starting to try and play the Irish tunes that had appealed to me in childhood. I soon found that standard harmonicas had some serious limitations when it came to emulating the flow, speed and beautiful ornamentation characteristic of traditional Irish music, as played on the commonly-used instruments such as fiddle, flute, whistle, pipes and button-box. I wanted to get 'that sound': to augment the harmonica's natural soulfullness with truly authentic stylistic expressions to create a harp style which respected the traditional approach but added a new voice. I studied the music intensively, and found that the only way to achieve what I was after was to change the harmonica itself. The three main innovations I have created for Irish harmonica are Paddy Richter Tuning, the Slide Diatonic, and the Irish Session Harp. However, these tunings and harmonicas are great for other types of folk and melody playing too. Paddy Richter Tuning is a whimsical name I coined for this slightly altered scale, as it was originally for the small 10 hole diatonic - which is in what's commonly called Richter Tuning. It involves just a small change: raising the 3 blow a tone to get the missing sixth in the home scale. That tiny one-note change makes a huge difference! Suddenly you can play Irish jigs and reels on the diatonic harp with great speed and facility. I first recorded with Paddy Richter on my 1994 album New Irish Harmonica and since then it has become widely known and quite popular. I've written a book for it, and also offer hand-tuned Paddy Richter diatonics to go with the book or buy separately. 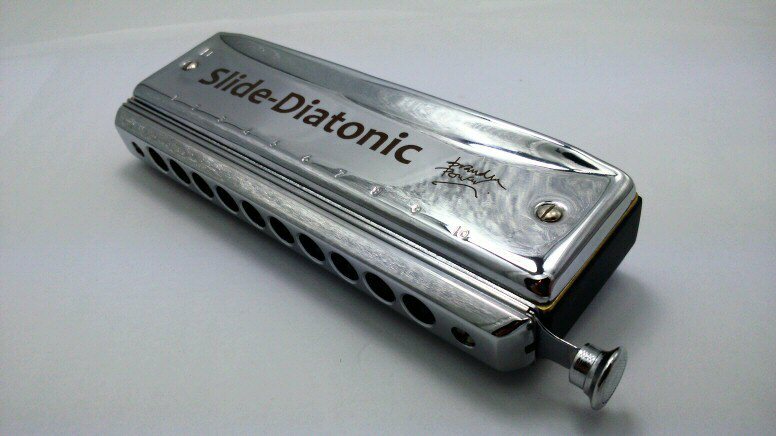 The Slide Datonic comes in 12 hole Solo Tuning and 10 hole Paddy Richter Tuning. It is a retuning for slider chromatic harmonicas that gives the player in-key slider notes. The slider is great for trills, turns, cuts, rolls and other decorations characteristic of Irish music, but it always raises the note a semitone. You can get away with it, as the slider notes go by very fast, but it is not really authentic for the modal-based scales of the Irish tunes. To overcome that problem I retuned the slider notes to the home scale of the instrument, to give a really sweet, authentic traditional sound akin to that of the whistle, flute and fiddle. Check the links above for more info and to hear the Slkide Diatonic in action. My unique Irish Session Harp is a single harmonica with the two main keys of Irish music (G and D) built in! The slider has no spring, so you can instantly select one or other of the keys without changing harps. I first sold it as the Trad Session Harp from 2000, and it's now available again. The Irish Session Harp comes in two versions: 12-hole Solo Tuning, and the latest, 10-hole Paddy Richter Tuning. Click the links for more info and video clips. The G/D Irish Session Harp is a revival of a harmonica I created for my own Irish playing in 1995 using chromatic harmonica parts, but with reedplates in the two different keys. The slider has no spring, and is held in or out with friction. With the slider out the harmonica played a low D scale in Solo Tuning. Press the slider in and you got a G scale. Two harps in one, G and D: perfect keys for 90% of Irish and Celtic tunes! The common way to play Irish tunes is in sets: several tunes one after the other, often with pleasing key changes between them. Normally harmonica players have to switch harps at that point, but having an Irish Session Harp means you can play most Irish sets on the one harmonica! Just move the slider to the opposite position with the flick of a finger and you're in the new key - it's so easy and fast. I sold it on my website from 2000-2006 (it was then known as the 'Trad Session Harp'). I released it again in 2013, made for me by Hering, re-named, and in two sizes/tunings: 12 Hole Solo Tuned, and 10 Hole in Paddy Richter tuning. Both are great for Irish music, but Solo tuning as on this page will suit chromatic players better, Paddy Richter will suit diatonic players more. If you're a diatonic player, go to the Paddy Richter version. Unfortunately there were supply problems with Hering, so the chromatic-based Irish Session Harp was discontinued. However, the same concept of two keys in the one harmonica is now available again in my own-design Switch-Harp. This is made in a modular fashion, using two diatonic harmonicas behind a master slider. The advantage of the new model are: It can be ordered in any combination of keys, several different brands, and any tuning you like! You could have just one front unit and insert different rear harp units as you desire. However the easiest option to make an Irish Session Harp for Solo tuning is the Hering Orchestra version of the Switch-Harp: a 10-hole harp that comes in Solo tuning in 5 keys: Low C, Low D, Low F, G and A. Choose the LowD/G harps for the common version of the Irish Session Harp, but you can choose other combinatiions also if you wish. Here is the scale layout and info for the Solo Tuned version of the Irish Session Harp, and below some photos of the old model (now discontinued). Here are some handy tips to fix sticking valves and enhance airtightness on your slider harmonicas. My 10-hole Irish Session Harp in Paddy Richter tuning is a unique and very useful harmonica. You can think of it as two 10 hole Paddy Richter harps in one. The overwhelming bulk of Irish tunes are in G and D major, and related minor modes. In the past, players had to switch between G and D Paddy Richter harps to get the right scales for each tune. But now it’s all there conveniently in one harmonica! I created Paddy Richter tuning to make playing Irish music easier on the blues harp, and first recorded with it on my 1994 album New Irish Harmonica. Paddy Richter works well for Irish music because all the main melody notes are there, but it’s almost the same as the standard Richter tuning: just the 3 hole blow raised a tone. But that small change makes a BIG difference, and Paddy Richter tuning has steadily gained fans ever since. 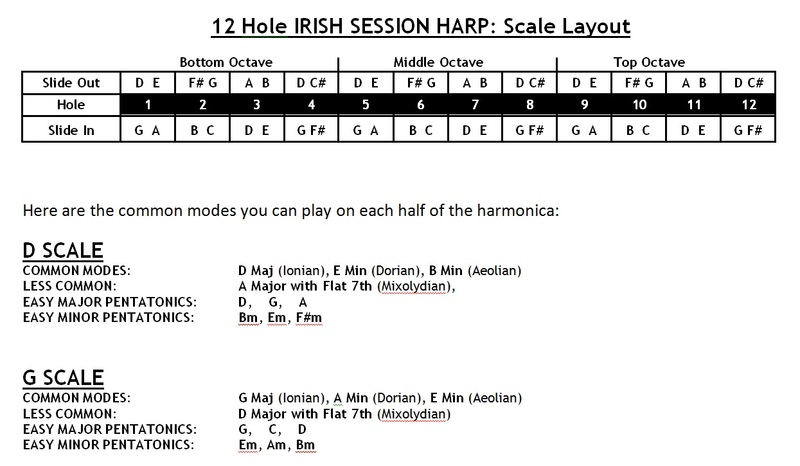 I made it available in my 10 hole Irish Session Harp from 2013; watch the video to see how it works. Unfortunately there were supply problems with Hering, so the chromatic-based Irish Session Harp was discontinued. However, the same concept of two keys in the one harmonica is now available again in my own-design Switch-Harp. This is made in a modular fashion, using two diatonic harmonicas behind a master slider. The advantage of the new model are: It can be ordered in any combination of keys, several different brands, and any tuning you like! You could have just one front unit and insert different rear harp units as you desire. However the easiest option to make an Irish Session Harp for Paddy Richter tuning is the Suzuki Promaster version of the Switch-Harp: a 10-hole harp that comes in Paddy Richter tuning in 12 keys and half-valved. The layout of the Irish Session Harp is simple: there is a G Paddy Richter scale on the top harp, which sounds when the slider is in the out position. Simply push the slider in and all your air goes to the lower harp, which has the D Paddy Richter scale. The slider has no spring, so will stay in position. 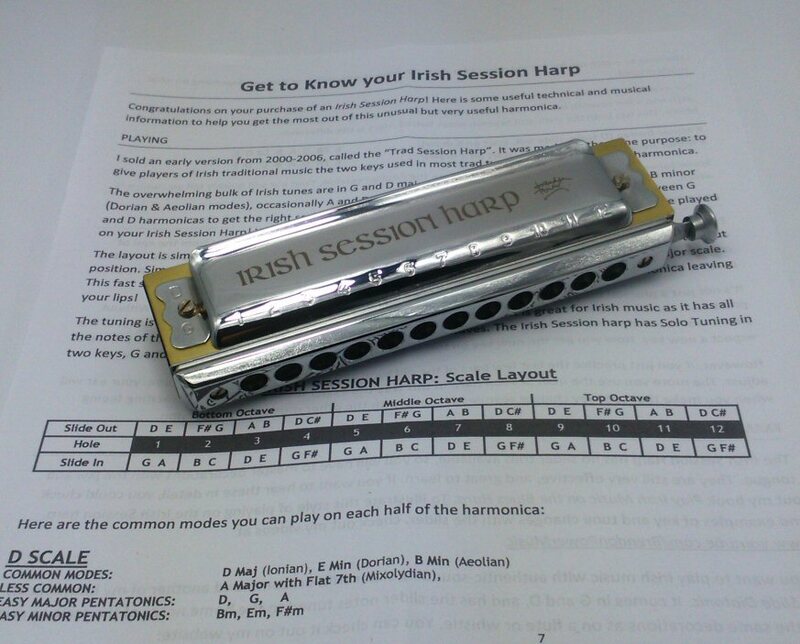 This fast selection means you can now play all the main modes of Irish music without the harmonica leaving your lips! 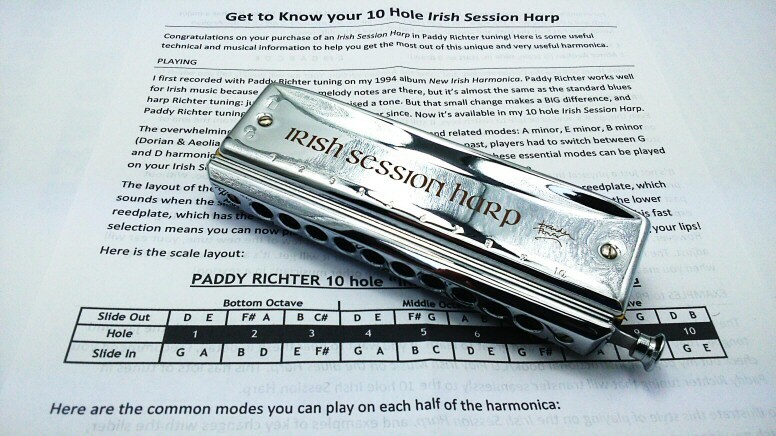 The Paddy Richter Irish Session Harp comes with handy in-box notes giving the common Irish modes and other useful info. If you don’t know much about modes and scales, don’t worry! Most traditional Irish players have no formal music learning and couldn’t name the modes they are using either. They learn by ear, which is the best way to really get the melodies and rhythms inside your body. Your ear will quickly tell you whether a particular tune suits the slide in or out. The Irish Session Harp has no slider trills available, so you will have to master decorations with the jaw and tongue. They are still very effective, and great to learn. If you want to hear these in detail, I recommend you check out my popular instructional book/CD Play Irish Music on the Blues Harp. This has lots of tunes in Paddy Richter tuning that will transfer seamlessly to the 10 hole Irish Session Harp. 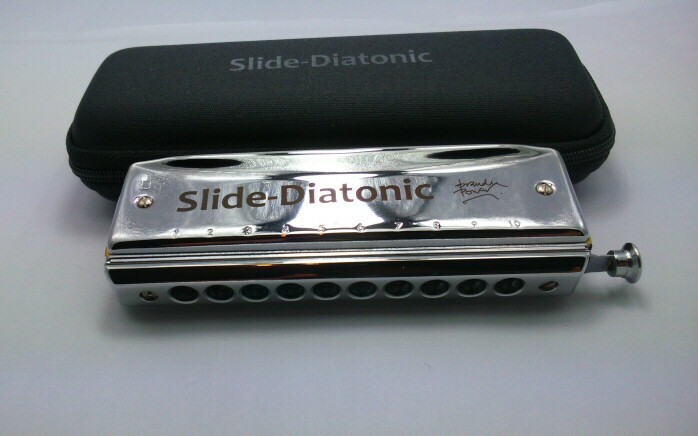 The Slide Diatonic is another of my harmonica inventions. 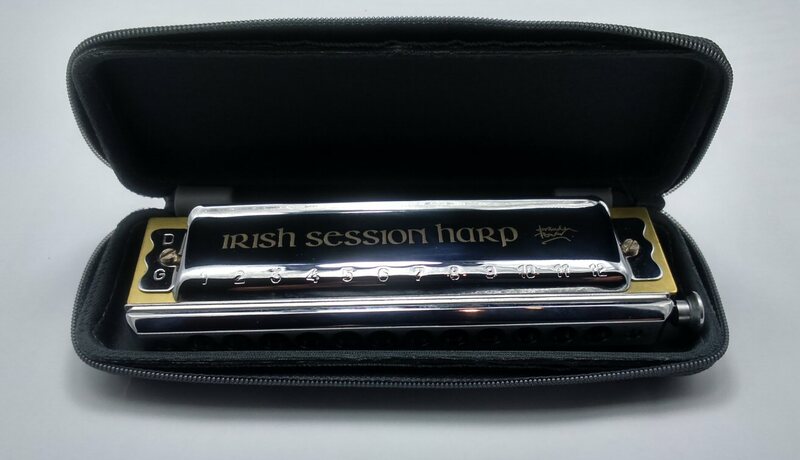 I first recorded with it on my 1994 album New Irish Harmonica, and I've used the Slide Diatonic for all my traditional Irish playing ever since. It's now available for the first time to buy, and only on this website. The Slide Diatonic comes in the two main keys for Irish music, D and G, as well as C (New! see below). The 12 hole is in Solo Tuning (same as standard chromatics), but I have a Paddy Richter 10 hole version also (both Solo and Paddy Richter are equally good for Irish music). I now have a NEW VERSION of the 12 hole model (May 2015). It's really airtight and comfortable in the mouth, with a smooth slide action. Please check the video below to see the Mk 2 version, and check the earlier video for the Mk 1 model to hear how easily and sweetly the Slide Diatonic adds in-key decorations to the main melody. All the slide decorations are identical in the Mk 2 model, with the added benefit that you can remove some outer valves for extra bending if you wish (demonstrated in the Mk 2 video). The Mk 2 model also comes in the key of C, as well as D and G. It will suit players who prefer to use C chromatics normally, as well as add an extra useful key for the G/D players. These harmonicas are sent to you direct by my business partner Roland, in Shanghai. This helps us to keep prices low and re-stock quickly. We use a respected Chinese courier company with tracking on all orders. In the rare event that your parcel gets lost, the courier company will need your contact telephone number. We recommend that you add the correct phone number into PayPal when you order, as this will ensure that you can be contacted in the event of an issue. (Your choice, but please note that without a valid phone number we cannot guarantee delivery). You really need both G and D Slide Diatonics for Irish music. Now you can buy the two for a discounted price! You can see that the slider raises each note to the next note of the G scale. If you press the slide in on a G blow note, the slide-in note is not G# (as on a normal chromatic harmonica) but A. The same principle applies to all the other slide-in notes. This gives the player a whole new and more AUTHENTIC sound for playing Irish and other folk music, including Chinese, Scottish, Italian... Most folk melodies around the world stay within a specific mode or scale. Chromatic notes outside that scale tend to sound harsh, because they are inappropriate for the style. The Slide Diatonic also gives the player lots of enharmonic (same-not choices). Every note of the scale is duplicated in a slide-in note, which allows the player to choose the best option for the music. This can be very helpful in playing fast dance tunes with big jumps. The 12 hole Solo-tuned Slide Diatonic comes with handy In-Box notes, showing the scales and other useful information. If you want more in-depth playing instruction for Irish music, my existing Book/CD package Play Irish Music on the Chromatic will work well with the 12 hole Slide Diatonic. It gives you all the info and tab for easy exercises and many tunes. Though the CD tracks feature standard chroms in G and D, the slider decorations taught will sound even better on the Slide Diatonic. At some stage I will create a book/CD specially for the Slide Diatonic, but for now that is a very good option.
" Thanks Brendan. 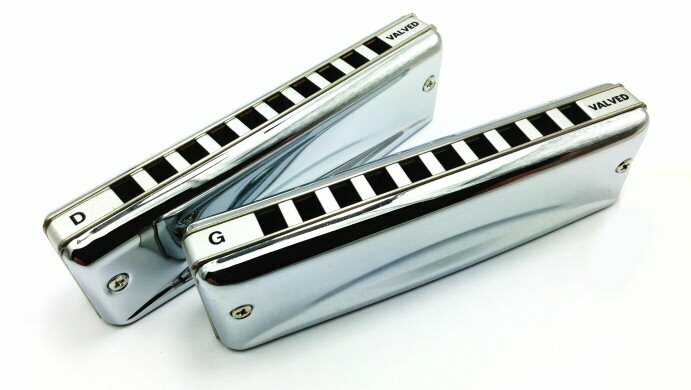 I absolutely love these harmonicas. I have played the G one constantly since I bought it. " 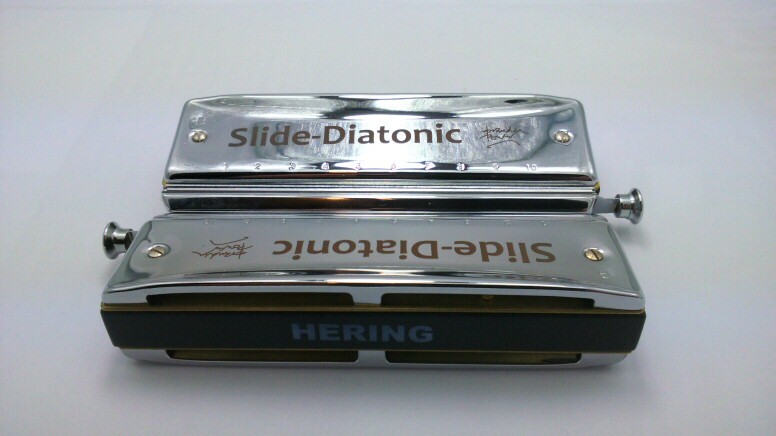 The Paddy Richter Slide Diatonic brings together two of my harmonica inventions: Paddy Richter tuning and the Slide Diationic. Paddy Richter tuning is a small modification to the common 10 hole diatonic tuning (known as Richter) to make it much better for playing fast Irish and other folk melodies. The only change is that 3 blow is raised one tone, but it makes a massive diference! Up till now it's only been available on the small 10 hole harp, but now for the first time you can buy a 10 hole Paddy Richter harp with a slider. As with my 12 hole Solo Tuned Slider Diatonic, the slider raises the main note to the next note of the home scale, to give really tasty and authentic modal slide decorations, similar to those used by flute, whistle and fiddle players. I first recorded with this magical combination on my 1994 album New Irish Harmonica, and I've used the Paddy Richter Slide Diatonic for my traditional Irish playing ever since. It's now available for the first time to buy, and only here. 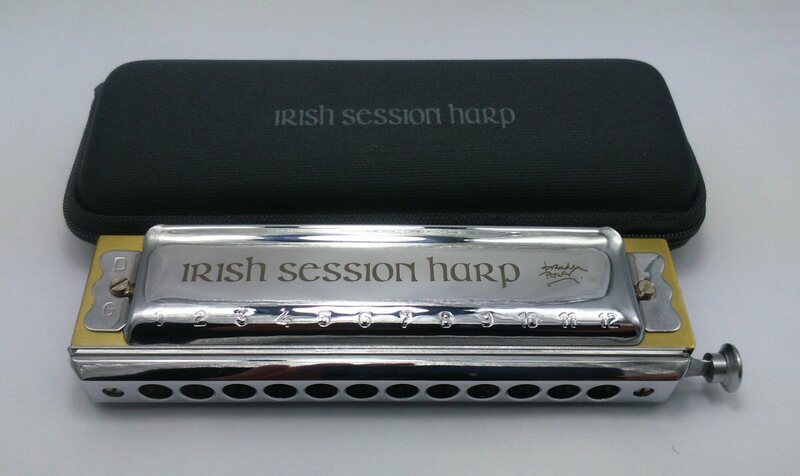 The Paddy Richter Slide Diatonic comes in the two main keys for Irish music, D and G. They are made to my specifications by the Hering company in a very responsive, free-blowing model with a CNC machined solid comb. Check out the video below to hear how easily and sweetly it adds in-key decorations to the main melody. You can see that the slider raises each note to the next note of the G Paddy Richter scale. If you press the slide in on a G blow note, the slide-in note is not G# (as on a normal chromatic harmonica) but A. The same principle applies to all the other slide-in notes. This gives the Paddy Richter harp player a whole new and AUTHENTIC sound for playing Irish and other folk music, including Chinese, Scottish, Italian... Most folk melodies around the world stay within a specific mode or scale. Chromatic notes outside that scale tend to sound harsh, because they are inappropriate for the style. The Paddy Richter Slide Diatonic also gives a player lots of enharmonic (same-not choices). Every note of the scale is duplicated in a slide-in note, which allows you to choose the best option for the music. This can be very helpful in playing fast dance tunes with big jumps, as it can reduce the distance you have to move your lips. For example, look at holes 6 and 7: you can now jump from D and E notes to the A above in adjacent holes! Without the slider you'd have to take your lips off the harp and jump a hole. If you select your notes in this way it can make many of the tunes much easier to play. Another example is shown on the video above. Paddy Richter tuning is growing in popularity all the time. Anyone who tries it for melody playing is hooked. Now you Paddy Richter heads have a new harp that gives you all the convenience of the tuning you love PLUS the tasty, sophisticated decorations used by other folk instruments. Paddy Richter is the whimsical name I gave to a simple tuning I devised to play Irish music on the 10 hole diatonic harmonica, first recorded on my New Irish Harmonica album of 1994. The standard harp tuning is known as Richter Tuning, the Irish are often affectionately called Paddies... and so Paddy Richter was born. Along with Paddy Richter tuning, I also invented half-valving on the harmonica (there is more detailed info on both further down the page). Half-valving really helps on harps used for Irish music, because it makes the important blow notes play louder, sweeter and with more soul. You can order the same excellent Suzuki Promaster MR-350V Half-Valved harmonicas in Paddy Richter Tuning that I use for Irish Music, in all 12 keys (plus Low F and High G). All harps are hand-retuned and have the outer valves trimmed back to avoid sticking. video link - Brendan demonstrates Paddy Richter. I'm now also offering Paddy Richter in 13-hole 4 octave format, in the form of my unique Lucky 13 harp. It gives you all the benefits of PowerBender/PowerDraw/Paddy Richter (choose one as appropriate), PLUS an extra low octave to extend the range. The Lucky 13 is like two harps in one, excellent value and a very good harp out of the box. Suzuki have famously durable reeds, but even they will fail after a lot of use. If a reed goes on your Promaster you can save money by buying replacement reedplates instead of the whole harp. The new plates are already in Paddy Richter tuning, and it’s a simple job to swap out the old ones. This makes a massive difference to the ease of melody playing on the 10 hole harp. Suddenly tunes that were very hard to play lay out beautifully - including Irish jigs and reels. These are played fast, and it's impossible to get that essential missing note (the 6th of the home scale) accurately at speed via bending. Paddy Richter builds it in to the scale as a simple blow note on hole 3. 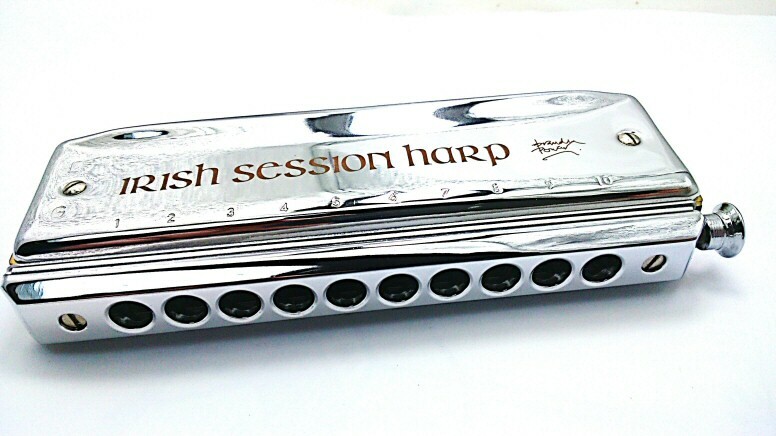 Suddenly the humble blues harp is transformed into an instrument that can easily keep up with flying fiddles, pipes and flutes at an Irish session! I've written a popular Instruction Book with 55 Track CD demonstrating how to play Irish Music on the 10 hole harp, including Paddy Richter instruction and examples. Click the link for more info and check out the comments on the book/CD and ProMaster harmonicas from many satisfied customers.